The class we had were really great! Daniela is an experienced, considerate and patient teacher.As a result, her classes were colorful and rich.We can choose whatever we like to learn,whatever we like to discuss during these classes.We can express our opinion and experience freely.Daniela would correct our mistakes of grammar and pronunciation.I really like this way of learning though we had five hours’ class each day we need to study. On the 17th of July, the students of St.John’s College performed the famous play,Hamlet,for celebrating their school’s 30th birthday.It’s a pity that Amy was so tired that she didn’t come with me.As a result,I just enjoyed it myself. The show began with the music which made people feel sad and upset.Suddenly,this was broken by two knights’ talk.The actors have really infectious and loud voices.All the people just got lost in the story and the world they painted.Hamlet’s sadness,hesitation，anger and the final relaxation，Ophelia’s desperation……The different feelings from different characters came out at different time.On the other hand,not only was the sound effect great,but also the scenes they made were beautiful. And the screenwriters have done some adaptations for this play so that it can be finished in two hours and a half.For example,they deleted the character,Fortinbras and the scenes which had something to do with him.But that doesn’t hurt.All of these met together and eventually brought the audiences special enjoyment of sight and hearing. .All the characters just show some sides of human nature,no matter they are good or not.It reflects the kindness and evil of human.Maybe that’s why it became famous and still very popular all around the world. Perfect story,good environment,fantastic actors,beautiful scenes,all of these belong to a great play.I believe most of you will enjoy it. The food in Cambrige was home–made, which tasted wonderful.We had different kinds of food from various parts of the world.Italy food，Indian food，British food……Daniela is really good at cooking! We even had some discuss about this.Both of us just agree that food in your hometown is the best.As the saying goes,east,west,home is the best.No matter where you go,whatever you like,the things in you hometown always take an important part in your heart! I had a really good time playing with Emma, the little sister in this family. For one evening, we played four different kinds of games. In China, when an elder kid playing games with an younger kid, the elder one usually let the younger one win on purpose. Parents tell us this can make the younger kid happy, which is the duty of the elder kid. Although I don’t agree with this idea, but I still follow it while playing with Emma. To my surprise, when Emma found that I was about to lose the game (and I had already lost several times) , she actually gave up a few turns in order to let me win easily. She also taught me some little tricks to win this game. She is such a smart girl which has a great kindness in her heart. She tried her best to make me enjoy the games, because she regarded me as a friend, instead of a competitor. I guess Emma’s friendly personality, positive attitude towards life as well as the incredible imagination mostly comes from the family education she has. And this can make us rethink about the family education we have in China. One the first day we arrived, Daniela had made a great plan about our trips, after considering about our own preferences. Because we were living in Cambridge, so I truly didn’t imagine that we can travel around London. It was so nice of her to offer this trip to us. On our first trip, we visited Cambridge. 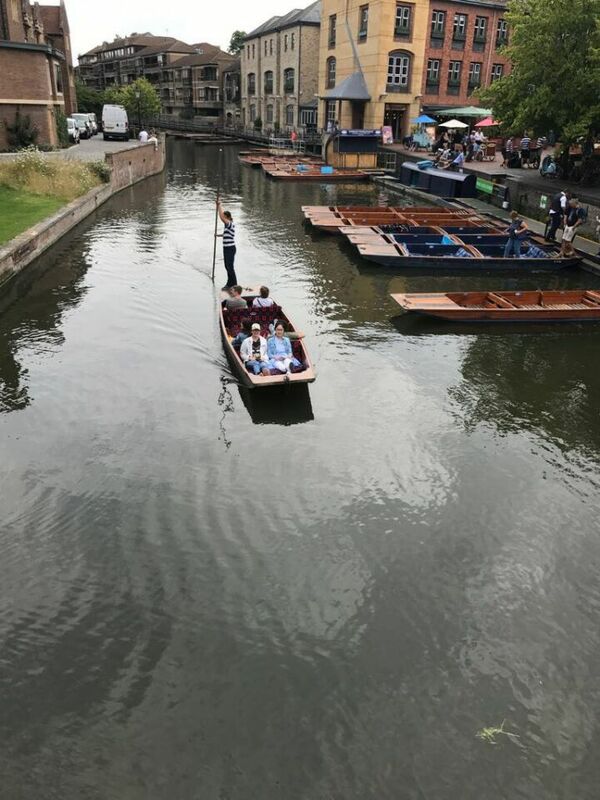 First, we had went punting on the river Cam. The view on the two sides of the river was gorgeous. There was a guid who introduced the buildings and the history behind them while rowing the boat. Then we climbed the tower of the St. Mary’s Church. Because the stairs were quite narrow and steep, Derek was very attentive that he took great care of us during the climb. After that, we went to two museums. I especially love the history museum there. It was quiet and you could spent a whole day there. We had also been to the Cambridge Botanic Garden. It was quite large, with fresh air, warm sunshine and breathtaking scenery.We had spent a great time there. In the whole day, we had encountered many Chinese tourists there. And I think we are actually much luckier than them, cause we have a perfect local guide who is very familiar with Cambridge. On our second trip, we went to the Wimpole Estate. I had watched the Downton Abby TV series. So I really found that estate amazing. In every room of it, there was a volunteer (mostly elder people). They would make a brief introduction of that room to you and willing to answer your question and have a discussion of the history in this house with you. I absolutely learned loads of interesting knowledges there and also enjoyed this trip very much. On the third trip, we went to London. It was a long trip. And we were a little bit tired. But I think it was definitely worthwhile to have this trip. We have taken a bus tour to the Buckingham Palace. The queen’s personal flag was flying that day, so she was in the house doing her work.We had taken a boat tour too. On the boat, we have seen the London Eye, the Houses of Parliament and the Tower Bridge very clearly. 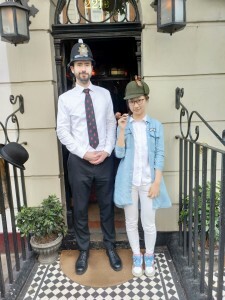 Then we stopped at the Baker Street to visit the museum of Sherlock Holmes. There was a long queue outside, but the things inside the house was amazing. Then here comes my favorite part. We went to the Platform 9-3/4!!! There was a half trolley in the wall. Just like in the films of Harry Potter. This is the place where they go to school every beginning of a term. There was a Harry Potter shop beside the platform. I couldn’t help myself from buying things!! I bought a scarf of Gryffindor, a time turner necklace which Hermione had worn and a very specific map. That was amazing !! Before our trip, Daniela always prepared enough food and drinks for us. During our trip, Derek has looked after us very well. It was very nice of the family to take us on these amazing trips.